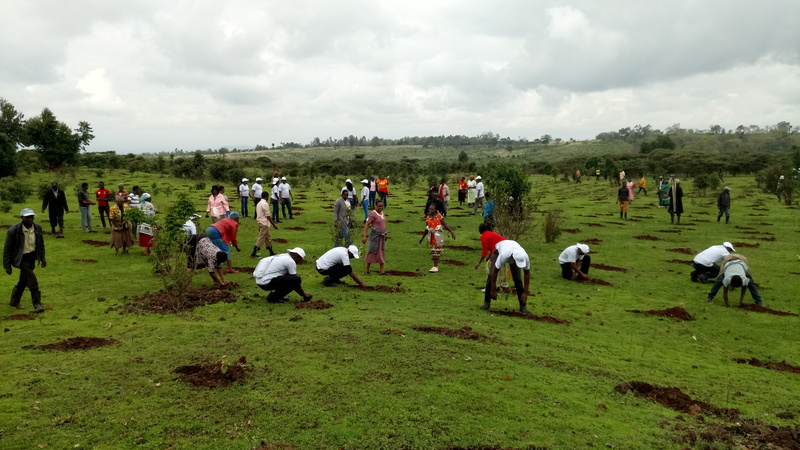 The ‘Kijani Team’ of Kenya Breweries Limited (KBL) joined Hombe and Kabaru Community Forest Associations (CFAs) and Nature Kenya staff in planting tree seedlings as part of the Mt. Kenya Forest restoration initiative last month. Two thousand tree seedlings were planted. So far the two CFAs, with support from KBL, have planted 47,000 indigenous tree seedlings during the ongoing short-rains season. Their target is to plant 100,000 tree seedlings to cover 250 Ha of degraded forest. The CFAs will take care of the tree seedlings for the next three years. KBL has further supported CFAs around Mt. Kenya with seeds and tree nursery implements. The donations will help the CFAs establish tree nurseries to raise over one million tree seedlings for future tree planting exercises. The Mt. Kenya Forest restoration initiative targets to raise Ksh. 140 million annually from downstream water users including businesses, hydropower producers, crop farmers and water transfer companies as payment for the forest’s ecosystem services. Funds raised will be used to plant 2 million trees to restore 2,000 Ha of Mt. Kenya and the upper Tana catchment landscapes. In March this year KBL donated Ksh. 8 million towards the Mt. Kenya Forest restoration initiative.